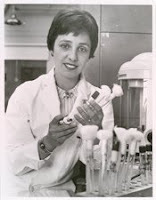 This week's woman of the week at CR4 is biochemist Maxine Singer, and it reminded me that I've had a post about her in my draft queue for a while that deserved to see the light of day (glow of the internet?). Maxine Singer earned her PhD from Yale just a few years after Watson and Crick published the structure of DNA. Her thesis advisor, protein chemist Joseph Fruton, advised her to focus on the then-relatively obscure field of nucleic acid biochemistry. In 1956 she joined Leon Heppel's lab at NIH as a post doc, one of the few labs at the time that was focused on nucleic acid chemistry. Singer synthesized specific RNA base sequences that were used to determine how those sequences were translated into the amino acid sequences of polypeptides. She and her colleagues were pioneers in the fledgeling field of molecular biology. Two years later NIH offered her a job with a lab of her own. It was like being a woman. It wasn't an issue where I was; I was very lucky. I was very naive. In those days, people didn't discuss the problem, and I've never heard anybody discuss it. I've been very, very fortunate in college to be in a place where it didn't matter and where most of the people who were really smart in science were women, just by dumb luck, in my class. I went to graduate school in a place that was very welcoming of women and I had no idea it was any problem. And then I went to the NIH as a postdoc and within a year and a half they offered me a job, so I never ever worried about it and I didn't think about it. In retrospect, the first time it had ever become an issue was when I realized I was having trouble getting postdocs to work in my lab and I went to the chairman of our department and said, "You have a lot of postdocs applying; how come I never got one in my lab?" And he was very straight with me; he said, "Nobody wants to come and work with a woman." So that was the first time that I really hit it, so I never had any kind of bad experiences, or I never noticed them. I'm not really sure which, but I didn't pay any attention, I was naive about it. So I wasn't looking. Sure, there's a problem. I was pretty dumb not to know it. But there is a problem. Look at this symposium. Liz Blackburn is one of the moderators, that is, she's introducing people, and I'm the only woman who's speaking in the whole program. And that's crazy, because there's a lot of terrific young women who are doing marvelous science and speak very well. It's kind of crazy that I'm the only one in the Symposium. And I suspect that that's why I'm here. They must have looked at the list that they had and said, oh, we can't do this, someone will complain. She and her husband, attorney David Singer, also had three children. She told a Washington Post columnist in 1960 ("Motherhood 'Myth' Miffs Mother Who Works" (pdf)) that she didn't think her children would "turn out terrible" because she spent little time with them on weekdays. "... I think my children are happy, alive, interested in the world around them, and not difficult to deal with," she said last week. Mrs. Singer always tries to get home on time from her job at the [NIAMD] to play with the children before their bedtime. Even when she is in the middle of an experiment and is "tempted to stay late" in the laboratory, she heads for home, "taking my paper work with me to do late at night. The men around here can work much longer hours than I, but that's one of the compromises one has to make." The last part doesn't sound much different from what many women scientists who are also mothers say today. Singer continued her research in nucleic acids and was intensely involved in developing related policy. In she co-chaired the 1973 Gordon conference where the potential risks of recombinant DNA technology and helped organize the famous 1975 Asilomar conference that assembled guidelines for use of the technology in research. She eventually rose to head the Laboratory of Biochemistry at the National Cancer Institute. Even though much of her time was spent on administrative duties, the research in her lab during that period made significant contributions to understanding the structure of the human genome. Singer had begun to focus on a large family of repeated stretches of mammalian DNA called LINEs, or long interspersed nucleotide elements, that are present with very little variation in the genomes of all mammals. Focusing on LINE-1, a DNA sequence repeated and interspersed thousands of times in human chromosomal DNA, Singer concluded that it is capable of transposition, or movement and insertion into new places on chromosomal DNA. (It is, in fact, to this point the only known human transposable element.) She studied the precise mechanism whereby LINE-1 replicates and disperses copies to new locations along the genome. She also posited that the insertion of transposable genetic elements into new genomic locations can induce mutations in nearby genes, and that LINE-1 transposition played an important role in genetic diseases. Researchers later confirmed Singer's suspicion when they found that LINE-1 insertions into a gene whose protein product is required for blood clotting are associated with hemophilia. In 1988 she became President of the Carnegie Institution, a post she held until 2002. While she was there, she established the Carnegie Academy for Science Education (CASE), which worked to increase teachers' knowledge of science and provide them tools for teaching. Chair of the National Academies Committee on Science Engineering and Public Policy, where she "addressed graduate education, postdoctoral scholarship, the plight of women in science, and scientific conduct." 1988 Distinguished Presidential Rank Award , "highest honor given to a civil servant"
Her Lab in Your Life "DNA: A Marvelous Molecule"